Social networking is constantly evolving. Gone are the days when MySpace ruled the web. Now, practically everyone's gone mobile, with more than 95 percent of teenagers having a cell phone. Real-time photos and video-sharing is the trend that young people are most excited about. Facebook has confessed that it has struggled to keep its younger users engaged and excited to interact on its platform, despite once being the ultimate go-to social network of choice for young people. So, where's the younger generation to go? They're already on their phones and tablets, of course, so they make the best of it by using the most popular social networking and messenger apps on the market. In early 2018, the top three social apps in use by teenagers were YouTube, Instagram, and Snapchat. Kids are flocking to these by the thousands every month. Parents should be sure to educate themselves and their teens on the dangers of online child predators. You might think YouTube would be the granddaddy in this bunch, but you'd be wrong. YouTube is wildly popular with teens and tweens, who visit it at a level that has almost doubled in the past three years. YouTube has added a strong influencer and vlogger base to what was once primarily a passive content consumption website, and the teens love it. In 2018, YouTube became the most popular social app among American 13- to 18-year-old teens. Snapchat is a popular private messaging app known for photos and short videos that are automatically deleted after they've been viewed. For teens, this "self-destructing" feature is a big part of what makes Snapchat so appealing, encouraging teens to interact more frequently, safe in the knowledge that all their previous snaps disappear. Snapchat isn't just a media-sharing app. You can even use it to send money to your friends. Privacy, sexting, and screenshot saving have posed some issues for Snapchat, but it remains one of the hottest apps with teens. Snapchat is available for download on mobile devices only. Facebook may have ruled social photo-sharing on the web, but Instagram arguably rules over it on mobile devices. Although Instagram doesn't openly share how many of its users are teens, it's not all that hard to see that this mobile social platform is filled with them. All you have to do is check out the photos on the opening screen or search through some popular hashtags to get a glimpse of how young the dominant demographic truly is on Instagram. You can connect to your Instagram account through your computer, Android, or iOS device. Lots of kids still use Facebook Messenger on their phones to get in touch with their friends, but Facebook also owns another messaging app called WhatsApp. WhatsApp has more than 1 million monthly active users as of late 2017, and they're not just using the texting feature. WhatsApp also lets you post status updates, send video, share your location, and make voice and video calls over the internet. The platform is completely isolated from Facebook, so teens don't need to worry about the two overlapping. WhatsApp is compatible with Android phones, iPhones, Macs and Windows computers. Like WhatsApp, Kik has become an insanely popular messaging app for teens who like to chat with their friends. It's just one of the other fast and intuitive messaging apps used as an alternative to SMS texting, requiring only a username rather than a phone number. In Kik, you can communicate with the world through a chat interface. If you take a look on Instagram, you'll notice that a lot of profiles list Kik usernames in the bios so that other Instagrammers have some way to contact them privately. Kik works with Android, iOS, Amazon, and Microsoft mobile devices. Telegram is interesting because it does a lot more than a typical texting app, and it's completely free with zero advertisements. All the texts and phone calls are encrypted through Telegram, and you can send absolutely any file type you want — even large ones up to 1.5 GB. This is unique to most messaging apps that support image and video files. The messages are synced across all supported devices because the messages and files are stored in the cloud. You can delete texts whenever you want and make secret chats that dissolve messages on a timer. You can address up to 5,000 of your closest friends in one single group message. IOS, Android and Windows Phone users can install Telegram, as can those on Windows, Mac, and Linux platforms. The web version lets you access Telegram from any computer without installing the software. 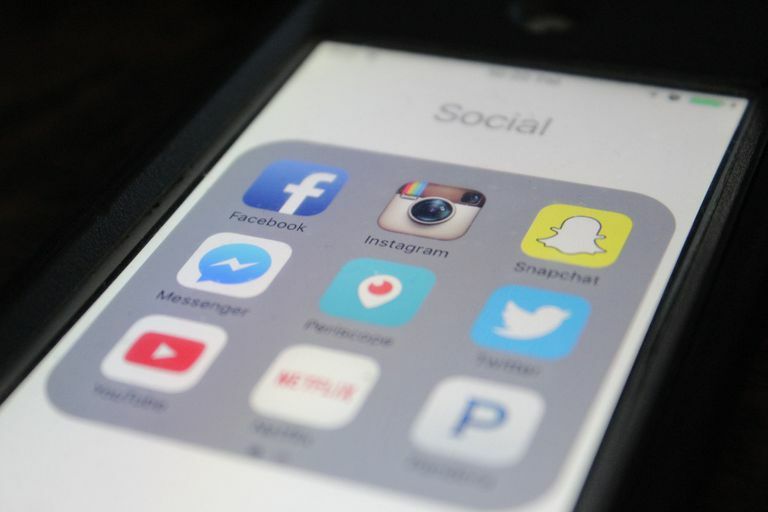 Teens have taken a liking to the Twitter microblogging social network, which is the hub for real-time news and connecting with high-profile individuals and celebrities. Because Twitter is so simple to use from a mobile device, it's convenient to access, but it's the visual component of embedded multimedia, such as photos, articles, and videos, in tweets that attracts most teens. Users can get on Twitter from their computer, phone or tablet. See all the different ways you can use Twitter on its apps page. Tumblr is one of the web's most popular blogging platforms, and a lot of teens have admittedly traded in their Facebook accounts for a Tumblr blog instead. Like Snapchat and Instagram, Tumblr is largely dominated by visual content and has become a favorite platform for animated GIF sharing. Although Tumblr allows its users to create blog posts in all sorts of formats including text, audio, quote, and dialogue, it's the visual content — the photos, videos, and GIFs — that makes time spent on Tumblr worth it. Tumblr can be downloaded on Android and iOS phones and tablets. It also works through a browser. ASKfm is a Q&A-based website and app that lets its users take questions from their followers, and then answer them one at a time, any time they want. It gives youngsters another reason to talk about themselves other than in the comment section of their own selfies! Although ASKfm may not be as huge as Instagram or Snapchat, it's a good one to watch, for sure. With such a big interest from youngsters, it has the potential to become the go-to place for Q&A content. You can use this service on the web and through the ASKfm mobile apps.